The Dolphin Stadium and Miami Dolphins required a robust and redundant solution capable of providing continuous, clean power to the array of servers, routers, firewalls, switches and telecommunications systems within each data center. 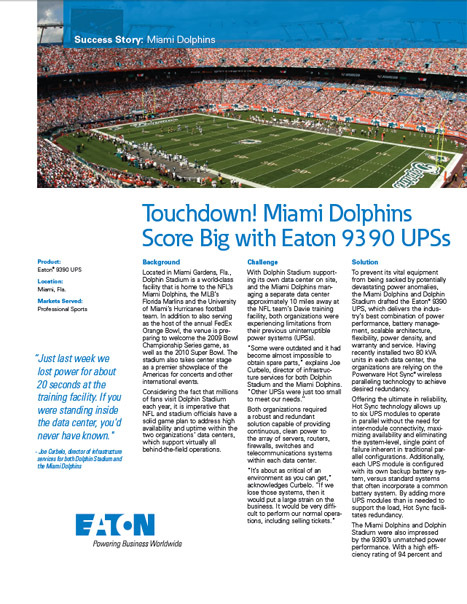 Four 9390 units scored big points with the Miami Dolphins organization, providing cost savings from the high efficiency design, an expansion capability and small footprint. With Dolphin Stadium supporting its own data center on site, and the Miami Dolphins managing a separate data center approximately 10 miles away at the NFL team’s Davie training facility, both organizations were experiencing limitations from their outdated UPS. The Miami Dolphins and Dolphin Stadium drafted two 9390 80 kVA UPSs in each data center to deliver the industry`s best combination of power performance, battery management, scalable architecture, flexibility, power density, and warranty and service.